I think your love for Voltes V (ボルテスＶ)depends on where you grew up. In the USA, Voltez V was farily unknown, aside from a few toys in the Shogun Warriors and Godaikin line. As a kid, I always thought he was some kind of Combattler-V copycat. I grew up with Combattler-V as part of the Shogun Warriors comic series and toy line, and I didn’t know much about Voltes at all. In other parts of the world, Voltes reigned supreme. In the Phillipines, Voltes is synonomous with Super Robots. The show was banned in the ‘70s by Ferdinand Marcos, Dictator of the Phillipines, due to its rebellious overtones. The cancellation of the show only fueled the nation’s passion for this Super Robot. Godaikin version 1983 (Same toy as version 2, minus some extra accessories, including a pen and book). With the Popy releases, there were minor packaging changes throughout the run. Some second version Volt in Box has black trays instead of blue and different locations for the pen and book. Also, the individually boxed vehicles had several different packaging variations, including slightly different box art. The Volt Crewzer has been seen in a bagged format as well. Bandai America brought Voltes V to the USA in the early 1980s. It’s essentially the same toy as the version 2, but does not include the pen or the book. 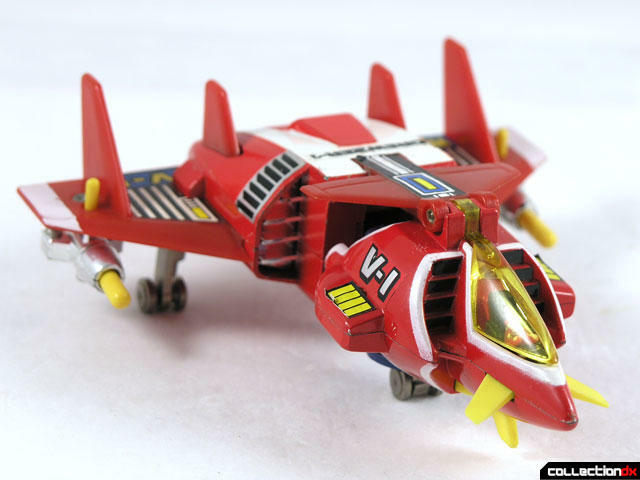 There are 5 vehicles that make up Voltes V.
Volt Crewzer is a red ship that makes up the head of Voltes V. It features small missile launchers under the tips of each wing and wheels to roll around on. Included are 6 yellow missiles, instructions, booklet and a catalog. 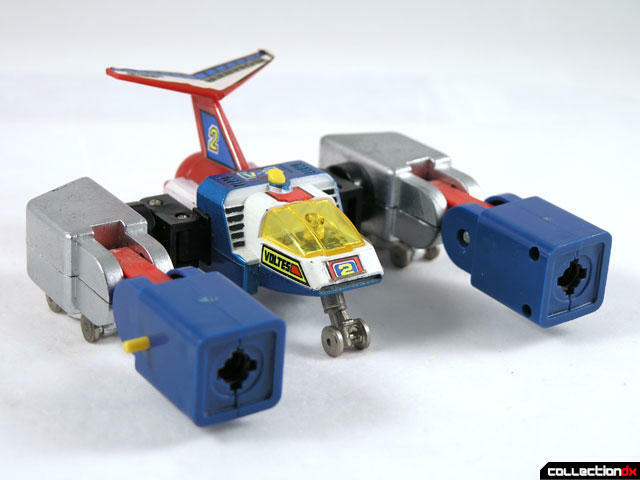 It is the only Voltes vehicle to feature a visible pilot. Be careful of the joint that connects the front and rear of the Crewzer – it is fragile and is prone to breaking. Volt Bomber forms the arms of Voltes V. The toy comes with one set of fists that fire from the forearms, a spinning top weapon, string for the top, chrome weapon, tail section, catalog, booklet and instructions. The landing gear is metal and folds down. Volt Panzer is a tank-like vehicle that forms the torso of Voltes V. It features articulated claws, working rubber treads, sword hilt and firing missiles. This vehicle is almost all metal. Included in the set are 6 missiles, sword segments, booklet, instructions and catalog. The rubber treads tend to deteriorate over time as the rubber dries out and begins to crumble. Fortunately there are sellers who sell replacement treads. 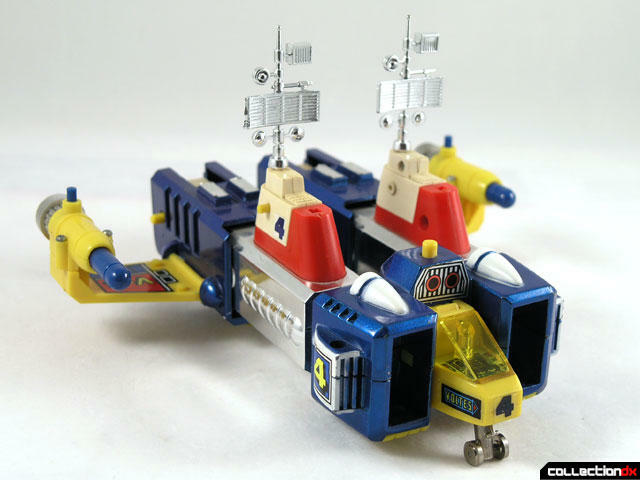 Volt Frigate forms the legs of Voltes V. It features 2 sets of missile launchers as well as fold-out wings and landing gear. The toy includes 2 chrome antennae, 6 blue missiles, 6 red missiles, catalog, booklet and instructions. 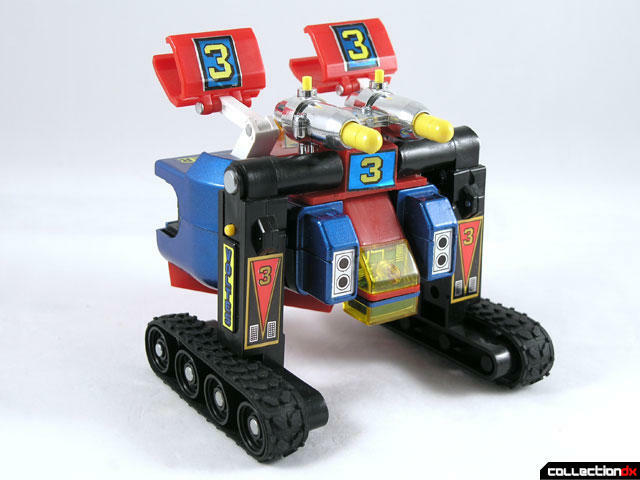 Volt Lander forms the feet of Voltes V. This toy has rolling rubber tires, retractable magnets and opening doors with firing drill missiles. Included in the box are 2 chrome antennae, 6 drill missiles, 2 rubber hoses, 2 white connector pieces, booklet, instructions and catalog. Start with the Volt Panzer. Pull the tank legs aside from the back and rotate backwards. Insert the Volt Bomber in the top, then fold the Volt Crewzer so the head is exposed and attach at top. Insert the cockpit of the Volt Frigate into the base of the Panzer. Separate the two halves of the Lander and fold the white towers down. Attach to the bottom of the Volt Frigate. Attach the hands and you are done! When combined, Voltes is solid and stable. He is probably the heaviest of the classic chogokins; a giant block of die-cast terror. In robot mode, Voltez has a lot of accessories at his disposal. 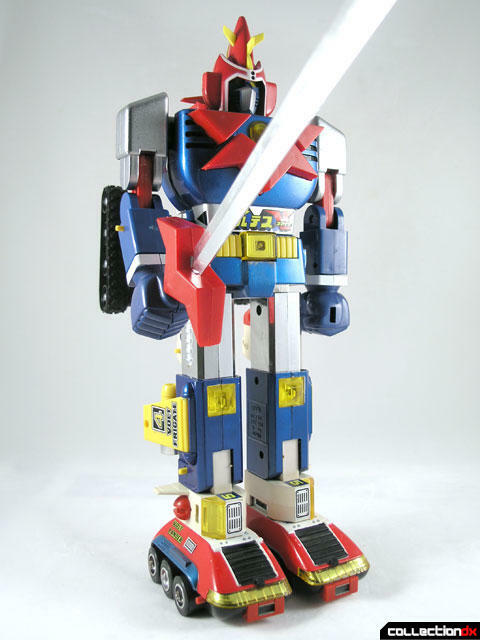 The sword is formed by removing the red hilt from the chest of Voltes. Insert the sword into the hilt and it slides into place. Other weapons can snap into the forearms in place of the fists. One weapon looks like a giant spinning top. Pull the string and the top launches. I believe this is supposed to replicate Voltes’ Choudenji Goma attack. There is also a chrome weapon that looks kind of like a blender tip – this is supposed to be the Chain Knuckle attack. 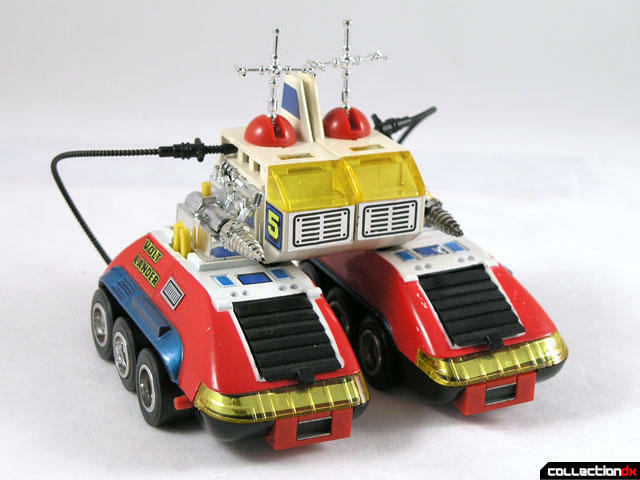 Voltes V also has a tank mode called "Voltank Mode". 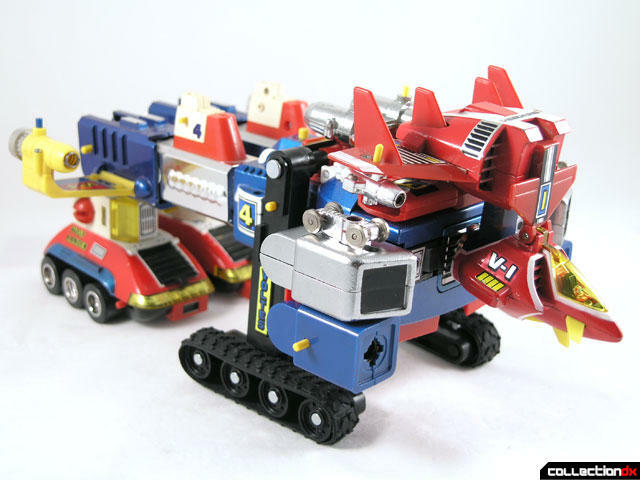 The treads swing around, the feet bend and Voltes can roll around like a giant tank. Not a remarkable transformation, but still fun nonetheless. I really really like this toy. It’s one of my favorite gokins. Unfortunately, acquiring a vintage Voltes V can get very expensive. Your best bet is to hunt down a Godaikin version as those can be found in the $600 - $900 range. If you want to try to track down a Japanese Volt in Box version, prepare to spend thousands of dollars. Bandai is releasing a new version of Voltes V – the Soul of Chogokin GX-31 in May of 2006. It probably won’t affect the price of a vintage Voltes, but it might be a more affordable way to get a die cast, transforming version in your collection. *The toy shown in this review is the one that came packaged indvidually in popynica boxes. The toy is identical to the Godaikin and second version popy.